Danone insisted that the advert's claims were "sound"
A TV advert which asserted that Actimel yogurt supported children's natural defences against disease has been banned by the advertising watchdog. 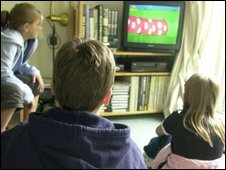 The Advertising Standards Authority ruled that claims that it could help protect school-age youngsters against illness were not supported by evidence. The advert stated that Actimel was "scientifically proven to help support your kids' defences". Manufacturer Danone said it was "very disappointed" by the ruling. 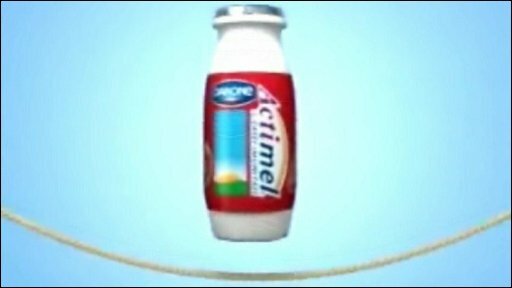 The advert showed a bottle of Actimel jumping over a skipping rope over a soundtrack of cheering children. A voice-over said "kids love Actimel and it's good for them too" before the words "scientifically proven" were stamped on the screen. But following an investigation sparked by a viewer complaint, the ASA rejected studies submitted by Danone to back up their assertions. ASA chief executive Guy Parker said the ruling was not a comment on whether Actimel worked per se, but was an adjudication on whether or not the specific claim that they made was supported by adequate evidence. "We thought that their evidence fell short. It wasn't a million miles away, it wasn't actually bad evidence, compared to some that we see, but it wasn't good enough to prove the claim," he said. A spokesman for Danone said its scientific claims were "sound and based on a large body of evidence". It said it had 24 published clinical studies demonstrating the product's positive health benefits in a variety of circumstances, for children through to the elderly. The company said eight studies were carried out on children up to the age of 16, two of which were carried out on hospitalised children in India who suffered acute diarrhoea or were taking gastritis-related medication. The ASA ruled that these two studies could not be applied to healthy youngsters. Two other trials were dismissed as the mean age in each of the sets of children under examination - six months and 15.5 months - were too young to apply to school-age children. Mr Parker said the advert had implied it was that age group that would benefit. The watchdog also decided that no health benefits could be established in relation to asthmatic children, and a drop in the number of children with allergic rhinitis and diarrhoea was too small compared to the control group to prove Actimel was the cause. In addition, it said that studies on children in day cay centres in the US and Russia found too small a reduction in common infectious diseases when drinking Actimel compared to not doing so. In the end, the ASA ruled that the advert was misleading and broke rules in relation to evidence and accuracy in advertising. A Danone spokesman added: "These studies are designed and approved by a board of internationally recognised experts with extensive, directly relevant experience in human clinical trials, effects of probiotics in the gut, paediatrics and immunology." Professor Jeremy Nicholson, head of surgery and cancer at Imperial College London, said there is some good evidence that these good bacteria are beneficial to people with health problems, but there had been no wide, long-term studies on healthy people. "These bugs have evolved with us and there's actually a gigantic number in the human body. To compete with the number of bacteria in your gut you'd need to have 50,000 pots [of Actimel] a day," he said. "There are 100 trillion bacteria in your gut, 1.5kg of them, so that's really quite substantial."